Welcome to the greener side of the fence. An abundance of natural beauty awaits in the many Dayton parks throughout the area. In fact, Five Rivers MetroParks features more than 16,000 acres of natural wonder for you to discover. Pursue outdoor adventures such as kayaking, cycling, fly-fishing and birdwatching, all while enjoying the wonderful sights and sounds around you. Serene lakes; striking waterfalls; lush greenery and much more. You can also enjoy a hike in one of our many trails or read a book under a great big tree near a meadow. This is Ohio recreation at its best. 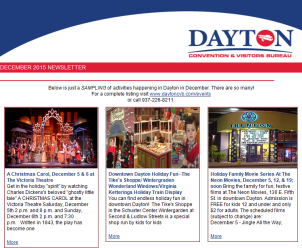 A wide variety of recreational and educational activities are enjoyed year-round in Dayton, by groups of all ages. Slow things down during your stay, and enjoy your leisure time in Dayton’s stunning green spaces. Dayton is an officially designated Trail Town through the Buckeye Trail Association and North Country Trail Association. This designation showcases Dayton as a hiking destination complete with quality trail, maps and resources along with nearby amenities such as camping, services, and supplies to support the hiker along Ohio’s Great Corridor. For a listing of camping and other services, visit outdoordayton.com. Nature is calling you. Check out our local parks and Ohio trails below.